How can I have a long beautiful Hair? One of the biggest myths about black hair is that it doesn't grow or grow as quickly as other types of hair. All hair grows an average of ½ inch per month, but it's how you treat your hair that determines how much you'll retain. Some women swear by vitamin regimens that call for popping pills all day long, while others cut their hair according to the phases of the moon. There's no mumbo-jumbo involved in hair growth. All that's required is your commitment to healthy hair practices and treating your hair with TLC. Hair is truly the richest ornament of women and one ought to take good care of it. If we check the anatomy of Hair on scientific basis we get to know the know-how of the hair in our body. Hair is a filamentous biomaterial, that grows from follicles found in the dermis. The human body, apart from its glabrous skin, is covered in follicles which produce thick terminal and fine vellus hair. Most common interest in hair is focused on hair growth, hair types and hair care, but hair is also an important biomaterial primarily composed of protein, notably keratin. Found exclusively in mammals, hair is one of the defining characteristics of the mammalian class. Hair-like structures, called cilia, but which are not classified as hair, are visible in organs such as the nose and ear and these structures also occur in many other organs of mammals, other animals, and plants. Although non-mammals, especially insects, show filamentous outgrowths, these are not considered "hair" either, in the scientific sense. These so-called "hairs" (trichomes) also are found on plants. The projections on arthropods, such as insects and spiders, are classified as bristles, which are composed of a polysaccharide called chitin. There are varieties of cats, dogs, and mice bred to have little or no visible hair (fur). In some species, hair is absent at certain stages of life. Hair often refers to two distinct structures: 1) the part beneath the skin, called the hair follicle or when pulled from the skin, called the bulb. This organ is located in the dermis and maintains stem cells which not only re-grow the hair after it falls out, but also are recruited to regrow skin after a wound; and 2) the shaft, which is the hard filamentous part that extends above the skin surface. 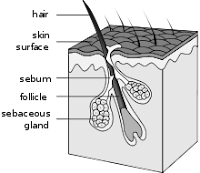 A cross section of the hair shaft may be divided roughly into three zones. 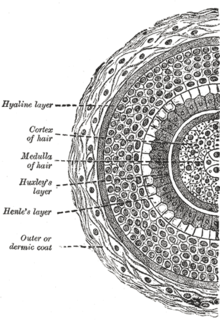 Starting from the outside: 1) the cuticle which consists of several layers of flat, thin cells laid out overlapping one another as roof shingles, 2) the cortex which contain the keratin bundles in cell structures that remain roughly rod-like and in some cases, 3) the medulla, a disorganized and open area at the fiber's center. All natural hair colors are the result of two types of hair pigment. Both of these pigments are melanin types, produced inside the hair follicle and packed into granules found in the fibers. Eumelanin is the dominant pigment in dark-blond, brown, and black hair, while pheomelanin is dominant in red hair. Blond hair is the result of having little pigmentation in the hair strand. Gray hair occurs when melanin decreases or disappears. Hair grows everywhere on the external body except for mucus membranes and glabrous skin, such as that found on the soles of the hands, feet, and lips. Now when we got to know about our hair and its importance we need to know How to care it with utmost care? The care that is required for our hair on a regular basis to make it lengthy and beautiful. Shampoos and other chemicals may damage our hair. We need to make sure the ones we are using do not contain any harmful chemicals. The most common tradition in the past was to use natural methods so that our hair grows longer, healthier and shiner. Before we get to the outside, we need to take care of the inside. Yes, what you eat, drink and how you treat your body has an effect on your hair. You need to eat enough fresh fruits and vegetables, drink enough water and exercise regularly for your body's overall health. Since your hair grows directly from your body, when you treat your body well, your skin, nails and hair benefit, too. People who suffer from vitamin deficiencies and unhealthy diets can suffer from dry, brittle hair. This sounds counterproductive if you want your hair to grow longer, but trims help get rid of dry, damaged and split ends which can work their way up the shaft of your hair, causing even more damage. A trim is defined as removing ¼ to ½ inch of hair, nothing more. If your stylist insists on cutting off inches of hair every time you go in for a visit, your hair won't get longer, so either find a professional who understands exactly how much hair you need removed or learn to trim your hair yourself. Depending on the chemicals you have in your hair as well as your daily routine, you may need a trim anywhere from every six weeks to six months. The better you care for your hair on a day-to-day basis, the less often you'll need trims. 3. Give yourself a head rush. Kick your hair follicles (and hair growth) into high gear by increasing circulation to your head. How? "There are three easy ways," says Riquette Holstein, author of Grow Hair Fast. One, get more exercise so your heart is pumping (yet another reason to get up off the couch). Two, flip your head upside-down once a day, brushing your hair from roots to ends (use a natural boar bristle brush to prevent breakage). Three, massage your scalp daily, using your fingertips. "You can do this while you are shampooing or just sitting around watching TV, It feels really good!" "You know That expression "You are what you eat"? Well, it happens to be true. Hair can only stay long and healthy if you eat well-balanced meals. Foods rich in vitamin A (dairy products, fish, spinach, apricots), vitamin B (meat, fish, bananas, leafy green veggies), vitamin C (citrus, melon, tomatoes and potatoes) and vitamin E (nuts, broccoli, whole grains) are essential for truly healthy hair. Feel like eating a steak tonight? Perfect. Red meat is rich in iron and zinc, two nutrients proven to help your hair grow its fastest. Studies show that hair actually grows slower when you are stressed to the max. Your hair also needs a good night's sleep. So chill out, and get some shut-eye already. Oily roots and product build-up can clog follicles and prevent your hair from growing as quickly as possible--the max is about a half-inch per month. So be sure to shampoo daily (or even more often if you work out) and give your hairbrush a weekly cleansing so you don't rebrush in old dirt and oil. Mix all of these thoroughly with the help of a fork until the mixture is somewhat frothy. Wet your hairs, apply your homemade product and massage gently into your hair and scalp. Leave this for five minutes and then rinse well with warm water. This will give you gorgeous hair with long lasting shine and softness. Soak these soap pieces into warm water for few hours till these are soft and slimy. Now mix well all ingredients into a bowl with the help of a fork or whisk wire. This could be your first homemade hair product and store it in a glass bottle. You can use it for 2- 3 days if kept outside the refrigerator. However, if a longer storage is required put it in the refrigerator. Soapnuts have always been renowned as natural shampoo throughout the known history. It is due to this soap forming nature that these are called "soapnuts". While the other ingredients of this homemade shampoo are Indian goose berry and Sikakai, both of which have been used to promote hair growth and treat thin damaged hairs for centuries. Take about one liter of water and simmer these herbs in it till just one cup is left, cool it and use it as a shampoo. This is a multipurpose remedy commonly used by Indians for centuries. Prolonged use promotes hair growth, give them shine & volume and also gives a good black color. The longer your hair is, the older it is. So treat it with the respect it deserves. When you lather up, use gentle shampoos formulated for your hair type. Treat your locks once a week to a leave-in conditioner or hair mask. And try to lay off your blow-dryer, hot curlers and flat iron as much as possible. Throwing your hair up in a ponytail to disguise growing-out layers? Be careful not to pull too tight--you'll risk breaking your hair. Yikes. If you currently relax your hair and see a lot of breakage and damage, consider stopping chemical processes altogether. Many women have rediscovered their natural texture after years of straightening. Learning to work with your hair in its natural state may take getting used to; some women don't know what their real texture is like because their hair has been permed since childhood. While cutting off all of your relaxed hair sounds like the last thing you want to do to gain length, getting rid of chemically processed hair at once, instead of trimming away as your new growth comes in, is the easiest way to return to your roots. It also leads to less breakage and less frustration in dealing with two different textures. Black hair is not as tough as it may appear, so you need to choose styles that keep its fragile nature in mind. Too-tight ponytails and braids worn over extended periods of time will eventually lead to breakage. Hair styling should never be painful! Think: Be kind to your hairline and choose hairstyles accordingly.